Cage Warriors Fighting Championship bantamweight title-holder Brett Johns is set to put his belt on the line in his native Wales. Johns (9-0) will take on James Brum on Saturday, April 12, 2014, when the promotion travels to Swansea for the first time for CWFC 67. The highly-anticipated meeting of Johns and Brum will headline the bill at The LC, having originally been scheduled for CWFC 62 in Newcastle this past December, until an injury forced the champion to withdraw. 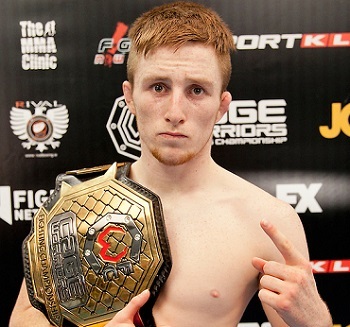 Undefeated Johns climbed to the summit of the CWFC bantamweight division at Cage Warriors 59 last September in Cardiff, when he overcame both David Haggstrom and Jordan Desborough in the same evening to win the promotion’s four-man 135lbs title tournament. A judo black belt, Johns debuted for Cage Warriors in October 2012 as a featherweight, when he impressively overcame Sam Gilbert by unanimous decision. His next CWFC win came via second-round TKO at the expense of James MacAlister at Cage Warriors 54 in May of last year. “I’m really thankful to Cage Warriors to giving me the chance to defend my belt in my hometown,” said Johns. “I’m training harder than ever and I’ll do whatever it takes to keep the gold around my waist. Brum (14-2) competes for the CWFC bantamweight title on the back of putting together a 7-0 streak under the Cage Warriors banner since making his debut for the promotion in February 2012. A 26-year-old native of Portsmouth, England, Brum hasn’t tasted defeat since facing current UFC star Erik Perez back in September 2011. Brum was named CWFC Fighter of the Year for 2012, courtesy of victories over Leandro Gontijo, Thomas Back, James Saville and Moktar Benkaci, before continuing his winning streak in 2013 against Olivier Pastor, Ruslan Abiltarov and – most recently, at December’s Cage Warriors 61 in Amman – Marat Pekov. Brum said: “I’ve been training with the best pound-for-pound fighters in the world at Team Alpha Male in preparation for this fight, and I’ve told the boys that I’ll be bringing my new shiny gold belt with me when I return to California. Keep track of Cage Warriors on Facebook and Twitter for ticket details and more CWFC 67 updates.